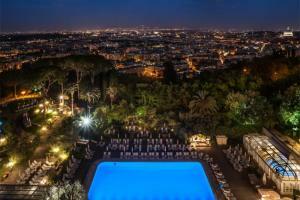 Rome Cavalieri, Waldorf Astoria Hotels & Resorts offers spectacular panoramic views of Rome. This luxury resort is perched atop 15 acres of private Mediterranean gardens. Guests can enjoy many unique amenities, including the only 3-star Michelin restaurant in Rome, a prestigious art collection, a luxury spa, four swimming pools and tennis courts. Accommodations include Deluxe or Imperial rooms and grand suites offering world-class amenities and breathtaking views across the Eternal City. Located in Rome, close to Vatican City, museums and historical sites.